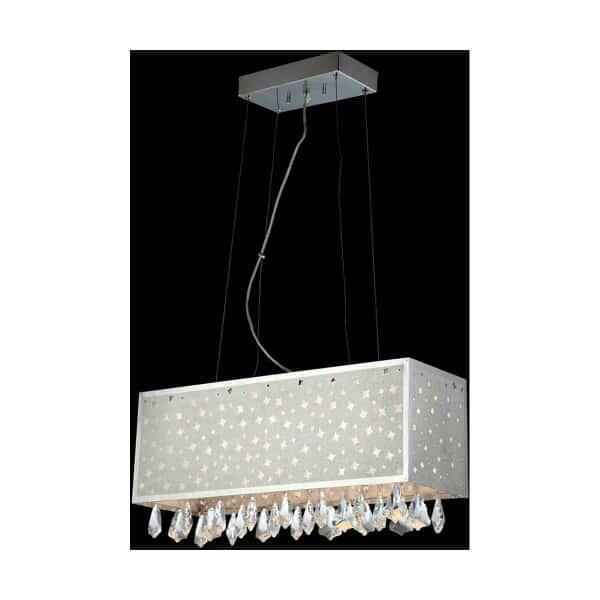 For those looking for a high end contemporary lighting solution for general lighting needs, look to the Santuzza line of lighting fixtures by Lite Source. The Santuzza is delicately detailed with the best lighting materials available. The light has three different settings that offer different styles of light. One setting offers LED lighting. Another setting offers halogen lighting. The third setting offers both LED and halogen lighting combined at once. The two toned lurex inset makes the Santuzza shine like the night sky with the starry detailing that allows glimmers of light to highlight and shine through the design with a different warmth. As with all Lite Source lighting fixtures, crystals make a fearless appearance in an original full cut assorted droplet style. If you’re up to make the lighting brighten both your room and your mood, look to the lighthearted, classy Santuzza I lighting pendant.